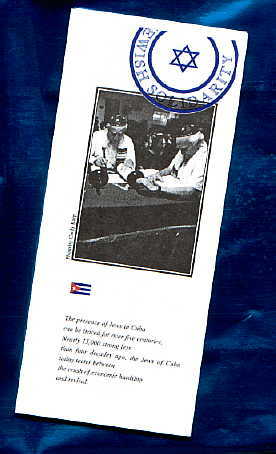 to restore hope and give sustenance to the Jewish community of Cuba. The presence of Jews in Cuba can be traced for over five centuries. Nearly 15,000 strong less than four decades ago, the Jews of Cuba today teeter between the crush of economic hardship and revival. The work of Jewish Solidarity, through its national headquarters in Miami and regional offices in Pennsylvania and California, cannot be accomplished without the support of caring people like you. Your tax deductible gift to Jewish Solidarity is deeply appreciated. Inquiries about the Project and travel with us to Cuba are welcome. Among the aid delivered to the Jewish community are books, school materials and supplies used by the Hebrew School which meets regularly in the Patronato. Since 1993, Jewish Solidarity has delivered over 35 tons of medicine, food and other supplies to Cuba's more than 1500 Jews in Havana and throughout this island nation. Regular trips to Cuba uniting those committed to the work of Solidarity and the Jewish community of Cuba highlights the project's goal of building bridges of hope, love and understanding. Among Jewish Solidarity's most important projects is assistance in the restoration of Cuba's Jewish cemetaries and houses of worship. Conditions are being identified and remedied by construction projects undertaken and lead by members of the Jewish community. Efforts are underway to rebuild the outer walls of the Jewish Cemetary in Santa Clara and to reclaim and refurbish the old synagogue in Santiago de Cuba. Jewish Solidarity has been traveling to Cuba for over 8 years, licensed by the US Department of the Treasury - OFAC (Humanitarian Religious Travels) and the US Department of Commerce (Export of Humanitarian Assistance). "We shall not forget you"
is the clarion call of Jewish Solidarity.